More coming soon! If your community has any events or tournaments you'd like for us to host, hop into our Discord and ask for an admin! French ALttP Randomizer Tournament. Sign up here! 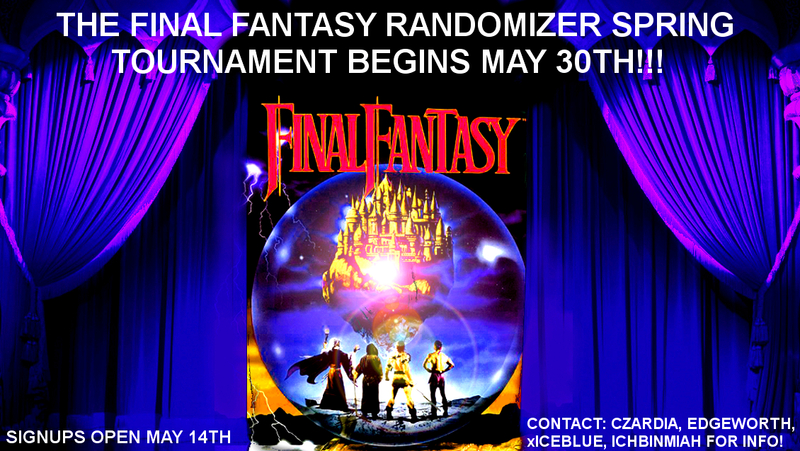 Final Fantasy Randomizer Spring 2019 Tournament. Sign up here! New Super Mario Bros Wii Any% Tournament. A Link to the Past Randomizer Overworld Glitches 2019 Tournament. Sign up here! 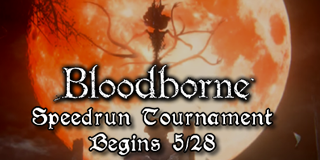 Bloodborne All Bosses Tournament 2019. Sign up here! 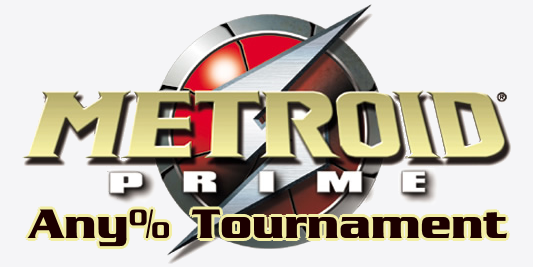 Metroid: Zero Mission 100% 2019 Tournament. Sign up here! Mega Man 11 Any% Tournament. Paper Mario: The Thousand-Year Door Extreme Randomizer 1-Hour Challenge Tournament. Octopath Traveler Tressa Single Story Tournament. Metroid: Zero Mission Any% Normal Tournament. 2018 One Shot Any% Tournament. The Messenger 8-Bit No OOB Tournament. A Link To the Past Randomizer Fall 2018 Tournament. 2018 Cuphead All Bosses Regular Legacy Tournament. 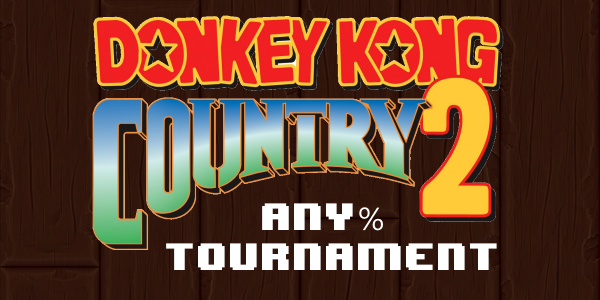 Donkey Kong Country All Stages Tournament. Super Castlevania IV 2018 Any% Tournament. Super Mario Galaxy Luigi Any% Tournament. The Legend of Zelda: Oracle of Seasons Any% Tournament. The Simpsons: Hit & Run All Story Missions Tournament. Super Metroid + A Link To The Past Randomizer Coop Tournament. F-Zero Classic "VS Mode" Tournament. A Link To The Past Randomizer Overworld Glitches 2018 Tournament. 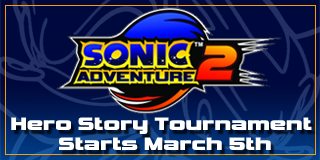 Sonic Adventure 2 Battle: Dark Story Tournament. Super Metroid 2018 Any% Tournament. A speedrun marathon of games from handheld consoles. July 13-15 Submissions. Super Mario Bros 3 Warpless Tournament. Megaman X 24 Mavericks Tournament. Chrono Trigger Defeat Magus Tournament. Resident Evil 4 New Game Professional Tournament. 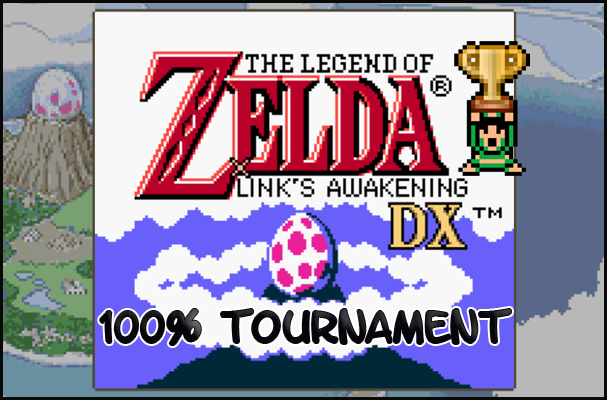 The Legend of Zelda: Link's Awakening DX 100% No WW/OOB Tournament. 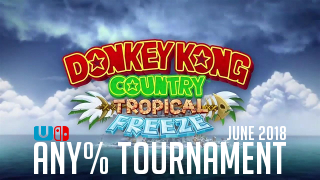 Donkey Kong Country Tropical Freeze Any% Tournament. 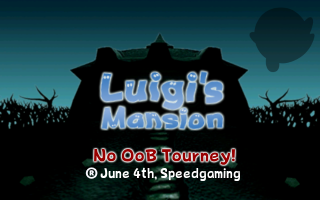 Luigi's Mansion No OoB Tournament 2018. 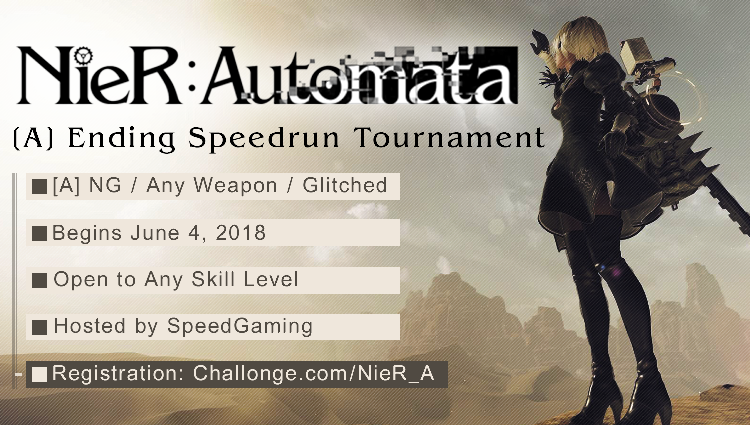 NieR: Automata - [A] Ending Tournament. 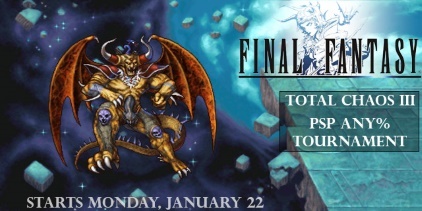 Final Fantasy 1 Randomizer Tournament. This weekend we're putting on a mini-tournament of Genesis games to accompany the release of the SEGA Genesis Classics Collection. Prizes provided by SEGA. May 25-29th. Details and signup. 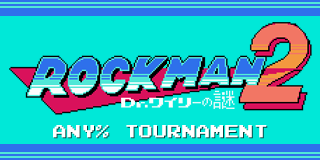 Mega Man II GB Tournament. A Hat in Time Any% Tournament. 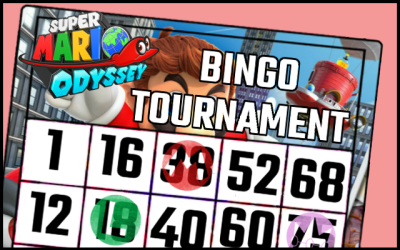 Super Mario Odyssey Triple Bingo Tournament. 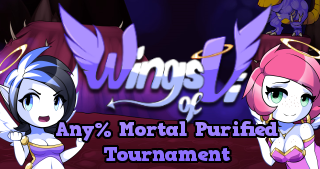 Wings of Vi Any% Mortal Purified Tournament. A Link To the Past Randomizer Spring 2018 Tournament. A 10-game speedrun competition. Games revealed in Apr/May/June. Qualifiers in July/Aug/Sep/Oct. The top 4 fly to France for the finals on Oct 27+28. 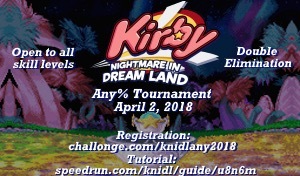 Kirby: Nightmare in Dream Land Any% Tournament. A Link To The Past Any% NMG 2018 Tournament. 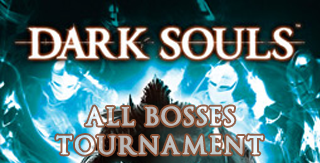 Dark Souls All Bosses Tournament. Super Mario Odyssey Any% Tournament. Super Mario 64 '70 Star' Tournament. Shantae and the Pirate's Curse Any% Pirate No OOB Tournament. Diddy Kong Racing All Trophy Races Tournament. 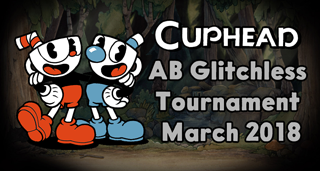 The 1st Annual "All Bets Are Off" Cuphead Tournament. 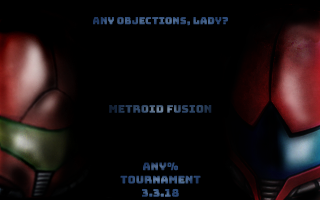 Metroid Fusion 2018 Any% Tournament. Kwirk "99 RMS Average" Tournament. Breath of the Wild All Dungeons Tournament. 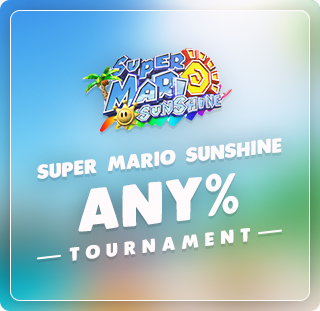 Super Mario Sunshine Any% Tournament. Shovel Knight: Plague of Shadows Any% Tournament. 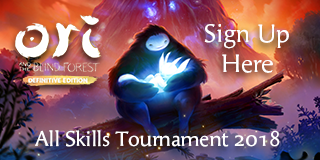 Ori And The Blind Forest All Skills Tournament 2018. Mega Man X4 Zero 100% Tournament. Super Mario Bros 3 Warpless Randomizer Tournament. 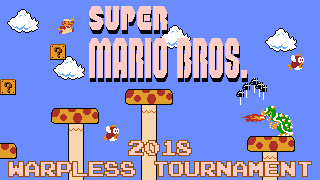 Super Mario Bros 1 Warpless Tournament. A Link To The Past Randomizer Keysanity Tournament. Final Fantasy 1 PSP Tournament. Zelda 1 Any% No Up+A Tournament. Final Fantasy 1 Randomizer League. RTA In Japan Marathon English Restream. 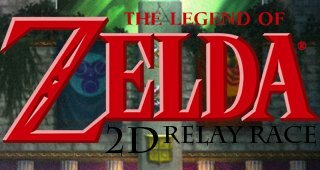 Every day at 2pm and 10pm ET we have races of ALTTP Randomizer that are open to the public, and are restreamed to one of the SpeedGaming channels along with commentary. Anyone can join the race on SRL. The category rotates, so we have some variety. One of them will be a special category that is chosen by the supporters of the SpeedGaming channel. Mega Man 1 All Stages Tournament. Mega Man X Any% Tournament. The End Is Nigh Friend% Tournament. Final Fantasy 6: Kefka At Narshe Tournament. The Tiny 10 is a race of 10 Game Boy games! Zelda 1 Randomizer Tournament Fall 2017. Pokemon Red Any% Glitchless Tournament. 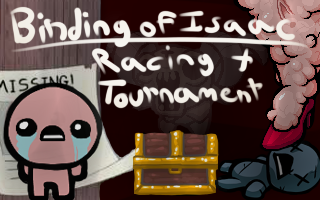 The Binding of Isaac Racing+ Tournament. A Link To The Past Entrance Shuffle Tournament. Pokemon Crystal Randomizer Cinco Bingo Tournament. Mega Man X3 Any% Tournament. Shovel Knight: Specter Of Torment Tournament. SpeedGaming and UltimeDecathlon are proud to present a speedrun tournament of the recently released SteamWorld Dig 2, a 2d action-adventure platformer in the metroidvania style. Qualifying races will take place on Oct 8th, Nov 5th, Nov 12th at 2:30pm EST (8:30pm CET). The event is free and open to anyone! Top 4 will be flown to France for the finals on Dec 3rd. https://swd2.ultimedecathlon.com/. Super Castlevania IV Any% Tournament. Super Mario Galaxy Any% Luigi Tournament. Metroid Fusion 100% Tournament 2017. Diddy Kong Racing 100% Tournament. Super Metroid Item Randomizer Tournament. A speedrun marathon of games from handheld consoles. Schedule. A relay race of the Super Mario 602, Rareware 301%, and Sprashfecta 642% back to back. Six teams. Starts at 5PM Eastern on July 14, ends July 16th. You can learn more here and here. Zelda II Randomizer Tournament 2017. 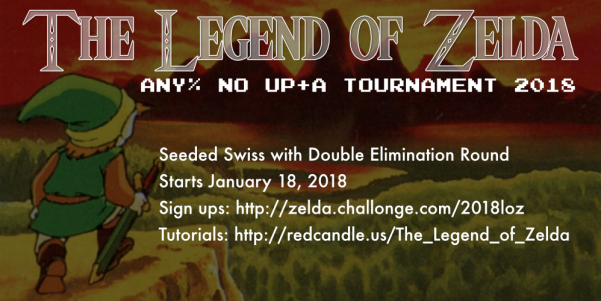 The Legend Of Zelda Randomizer Tournament 2017. The original Zelda, reshuffled. Website. A Link To The Past Randomizer Tournament Spring 2017. Mega Man 3 Buster Only Tournament. Final Fantasy Mystic Quest Any% Tournament. Mega Man X2 Any% Tournament. Match schedule. A race of 16 SNES games! Game list. For each game we play a short goal. Total time will be about 3 hours for the top finishers. Sign up here and join the race channel on SRL the day of the race. Sunday May 21st at 12pm EDT (6pm CEST). Mega Man 3 Tournament. Standings. Match schedule. 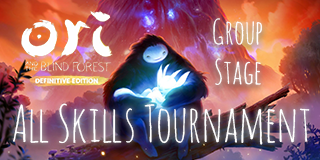 Ori And the Blind Forest -- All Skills Tournament. Match Schedule. 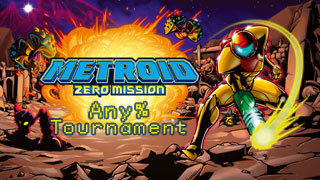 Metroid Zero Mission 100% Tournament. Tiny Ten Race #5 -- A race of 10 Game Boy games. SNES Super Stars Marathon 2017! A week-long marathon of Super Nintendo speedruns. March 10th - 10th 2017. The Master 15 #3: A race of 15 games from the Sega Master System. Mystery Tournament X. The largest blind race tournament in the world. Metroid Zero Mission Any% Tournament. Kirby: Nightmare In Dream Land Tournament - SRL Get Yourself Speedrunning #5. Donkey Kong Country 2 Any% Tournament. The DuckTales NES Any% Tournament 2017. Portal Tournament - SRL Get Yourself Speedrunning #5. Super Metroid 100% Tournament. Bracket. Schedule. Final Fantasy IV Tournament - SRL Get Yourself Speedrunning #5. Shovel Knight Tournament. Bracket, Schedule. Final Fantasy 1 PSP Tournament. Match schedule. The "RTA In Japan" Marathon. Dec 27th - 29th. Schedule. Organized by the Japanese speedrun community, with an English restream. Finals of the Little Mermaid NES tournament. SegaSpeed Marathon. A speedrun marathon of games from Sega consoles. The NES Classic Edition Invitational Race. A tournament of Dragon Warrior 1 (NES) Randomizer. 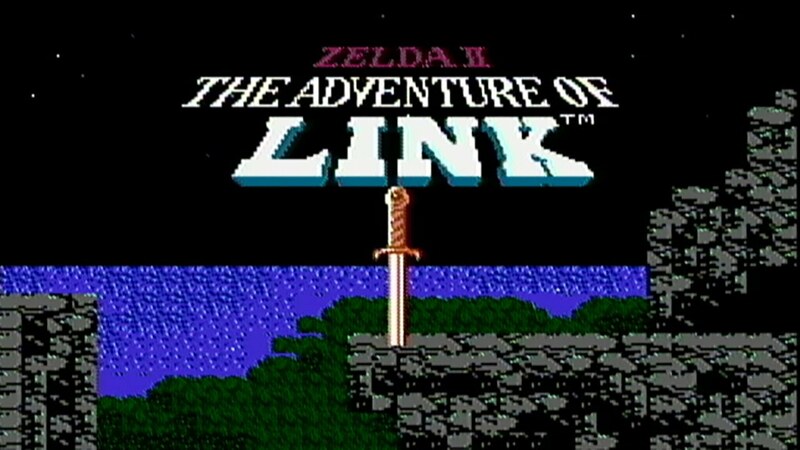 The Zelda II 100% All Keys Tournament. The original BAD GAME tournament, Kusogrande, is back. The worst games raced by the best players. Match schedule. 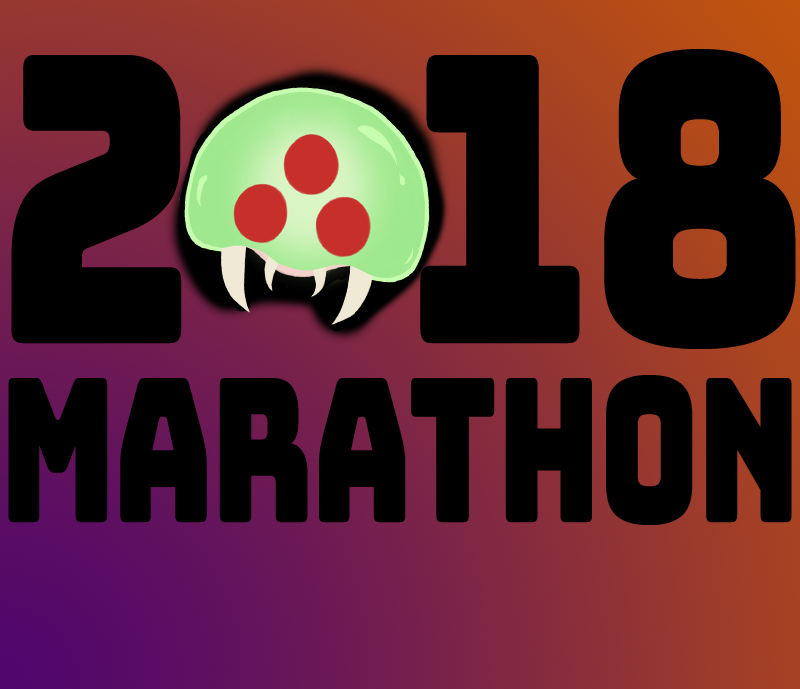 The Best of NES Marathon includes some of the best (and worst) games for the NES being speedrun by their top players. Schedule. The Master 15 #2: Fifteen Sega Master System games raced back to back! Diablo II Tournament (Beat Act 2) for Get Yourself Speedrunning on SpeedRunsLive. Zelda II Randomizer Tournament 2016. Super Castlevania IV Any% Tournament for Get Yourself Speedrunning on SpeedRunsLive. The SpeedRunsLive Mystery Tournament 9. Super Metroid Double Anti-Bingo Tournament 2016. The SNES turned 25 on August 23rd. We celebrated its release with runs and races of Super Mario World, Gradius III, F-Zero, Pilotwings, and SimCity. 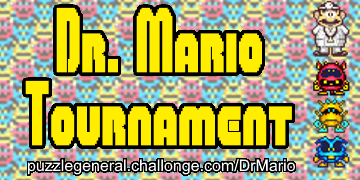 Dr Mario SNES Tournament, hosted by Puzzle General. 1P mode. Levels 0-10 for round robin, 0-20 for playoffs. Metroid Fusion Any% Tournament 2016. Super Mario 64 70-star Tournament for Get Yourself Speedrunning on SpeedRunsLive. Super Meat Boy Any% Tournament 2016. Qualifying Rounds, Finals. Super Metroid Any% NMG Tournament. Match results. Assault Android Cactus Tournament 2016. 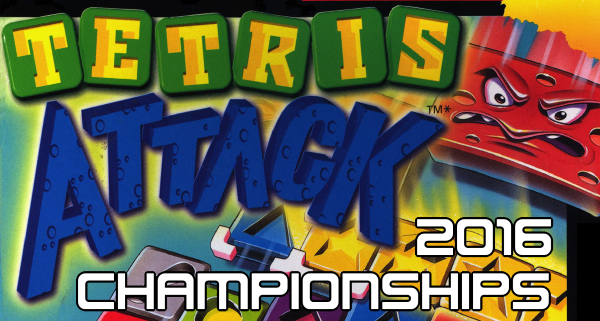 Finals of the Tetris Attack Tournament 2016. A Link To The Past NMG Tournament. 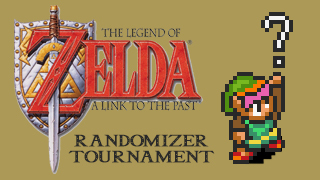 The Legend Of Zelda Randomizer Tournament 2016. Super Mario World "All Castles" Tournament. Ninja Gaiden II Any% Tournament 2016. Mega Man X Tournament 2016. A week-long speedrun marathon of over 150 SNES games. The Master 15: Fifteen Sega Master System games raced back to back!